QUEENSLAND'S leading motoring group has called on police to investigate a heated confrontation between a pedestrian and a cyclist in its entirety. RACQ spokesman Steve Spalding said common courtesy should have prevailed when a minor run-in between the pair escalated into a physical clash. The technical and safety boss said the behaviour of both parties should be examined and not just the action of the pedestrian who allegedly assaulted the cyclist. Under Queensland's road rules, cyclists of any age are allowed to ride on a footpath unless otherwise signed but they must give way to pedestrians and ride in a manner that does not inconvenience or endanger other footpath users. "You effectively had two parties on a collision course and that doesn't mean automatically one was doing the wrong thing," Mr Spalding said. "The individual circumstances have to be looked at by the police and they have to make a call, but that sort of violence, on a footpath whether they are walking or cycling, is unnecessary. "They need to look at it in its entirety. The behaviour of the individuals from pre-collision to the behaviour afterwards." Mr Spalding's comments are in relation to an incident in which cyclist James Stevenson claimed he broke his ankle after being attacked by a male pedestrian in the CBD. Footage of the confrontation, in Hutton Lane, shows the pedestrian and Mr Stevenson extremely close as they pass each other and then the pedestrian running back towards him. "I didn't give it (the brush) much thought and just carried on. Next thing I know is I feel a punch from behind," he said. "I turn around to see what's happened and another one has landed on me, pushing me over." 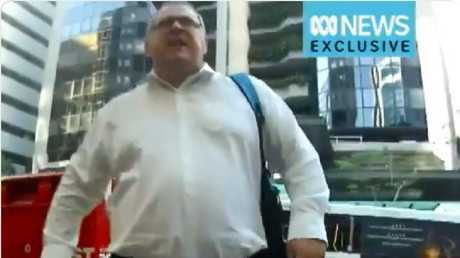 Footage of the incident was shown on ABC TV. Bicycle Queensland ceo Anne Savage said cyclists should give way to pedestrians and that there was no speed limit for cyclists who travelled on footpaths. "If you're on a bike, you must do your best to give way to pedestrians, although this does not give people who are walking have the right to unreasonably or intentionally block and obstruct shared paths," she said. "Bicycle riders are encouraged to always maintain a safe stopping distance from pedestrians, to try and prevent conflicts and collisions as much as possible." Mr Spalding said the sharing of footpaths came down to "common sense". He said while there was no speed limit, cyclists were expected to travel at a reasonable speed. "It's just the same as if someone was training for the next marathon and they are racing through the CBD and bashing into pedestrians," he said. "It's about common sense and being courteous." Police have said they investigating the incident. "If you ride unsafely, inappropriately or discourteously then that's a behaviour that should be dealt with."